I loved the first ColdHeat tool when it first came out and this new version looks nice and beefy. I used to solder stuff quite a bit as a young lad, using my father's old wood-burning kit to melt beads of metal into my skin. I never really knew what the hell I was doing, so I usually just ended up with a bunch of hot, melted junk that smelled bad. ColdHeat kind of let me solder without the risk of killing myself, which was nice. 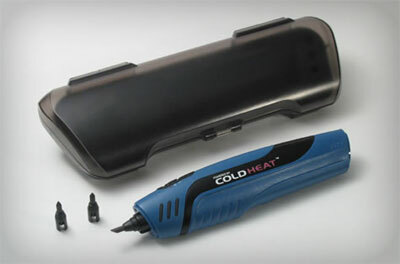 The ColdHeat Pro uses one batteryfive batteries, heats up instantly, and cools down almost as instantly. When you touch the tip to metal it completes a circuit and starts to melt whatever its touching. Pull it away and the tip cools down. There's even a handy little LED at the end so you can see what you're doing.